Ignas Brazdeikis scored 20 points to lead the 18th-ranked Wolverines to a 66-47 victory over Providence in Sunday's championship game. UNCASVILLE, Conn. (AP) — Michigan showed off its offensive versatility and a relentless defense in winning this weekend’s Air Force Reserve Tip-Off tournament. 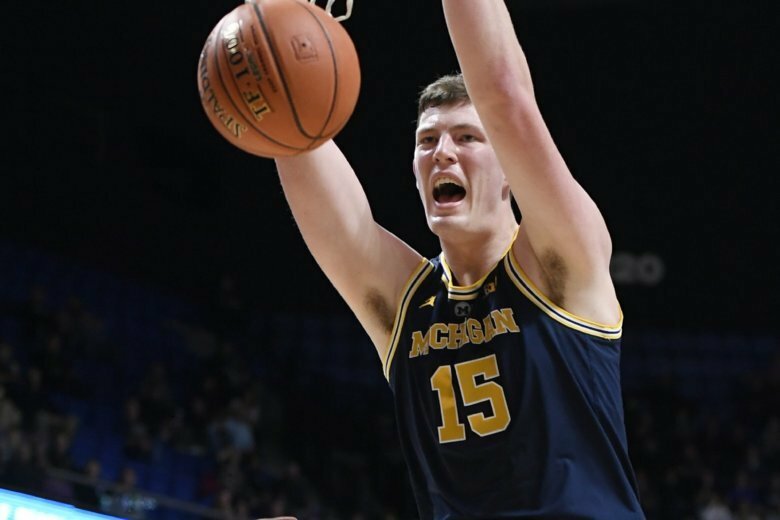 Ignas Brazdeikis scored 20 points to lead the 18th-ranked Wolverines to a 66-47 victory over Providence in Sunday’s championship game. Jon Teske added 17 points for Michigan (5-0), which was coming off blow-out wins away from home on Wednesday over No. 8 Villanova (73-46) and on Saturday in this tournament against George Washington (84-61). The Wolverines made 15 3-pointers against the Colonials, but were just 6 of 18 from behind the arc on Sunday. They found success down low in a more physical matchup with the Friars. They outscored Providence 32-22 in the paint, with Brazdeikis and Teske converting 14 of their 24 shots. The game was close until Michigan closed the first half on a 14-2 run and went into intermission up 35-22. Consecutive 3-pointers from Isaiah Livers pushed the lead to 44-29 early in the second half and the Wolverines pulled away late. Providence concentrated on taking away Charles Matthews and Jordan Poole, who combined for 47 points in Michigan’s semifinal win. The pair had just five and four points respectively on Sunday. So the Wolverines went elsewhere. Livers finished with eight points and six rebounds. David Duke had 12 points for Providence (3-2), which was held to just 28 percent shooting by a Michigan defense that has given up an average of 47 points per game. Providence made just two of 18 shots from 3-point range. Their 22 points down low also was a season low. In the other game, South Carolina routed George Washington 90-55. South Carolina’s Chris Silva came out of a shoulder harness that he’d been wearing since the preseason and came out of his shell against George Washington. Silva scored 20 points and grabbed 10 rebounds to lead the Gamecocks in the consolation game of the Air Force Reserve Tip-Off tournament. Coach Frank Martin said Silva had been wearing the harness since hurting his left rotator cuff in a preseason scrimmage against Virginia Tech. The 6-9 senior hadn’t been in double digits since a 13-point effort against USC Upstate in the Gamecocks opener. A.J. Lawson added 19 points and nine boards for the Gamecocks (3-2), who put the game away early against the winless Colonials (0-5). South Carolina scored the first 18 points, capped by a 3-pointer from Tre Campbell less than 5 minutes into the game. He was 3-for-3 from behind the arc in first half. A 3-pointer by Lawson seven minutes later pushed the lead to 40-6. The Gamecocks went into halftime up 56-18 and cruised after intermission, leading by as many as 42 points. Silva said the team was pleased with how his team bounced back from Saturday’s loss to Providence, a game which the Gamecocks led by as many as nine points in the second half. Terry Nolan Jr. led George Washington with 13 points. The Colonials shot 28 percent from the field, including just four baskets on 27 shots in the first half, when the game was decided.